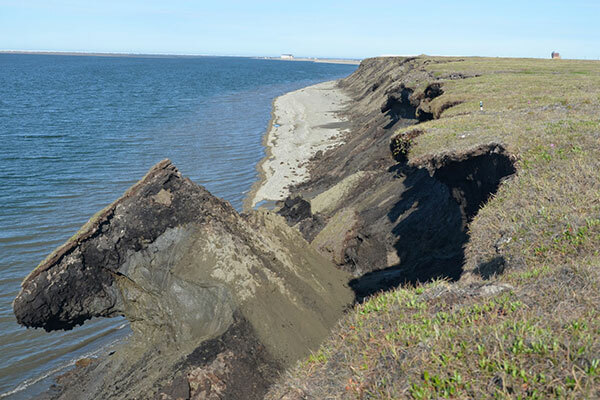 Communities along the far northern coastlines of Alaska are witnessing some of the highest erosion rates in the world. Less and less sea ice cover results in the direct exposure of coastal soils to the destructive blunt force of powerful wave energy. That, coupled with permafrost thaw and sea-level rise, means the region can lose upwards of 50 feet of coastline per year in some locations. Such a dramatic loss of coastal lands along Alaska’s North Slope has serious impacts on the villages that call the region home. Erosion is putting valuable community assets—like traditional lands, industrial sites, military infrastructure, and municipal utilities—at serious risk. Michael Brady, a doctorate candidate at Rutgers University in the Geography Department, is leading a National Science Foundation-supported project to document and map community exposure to coastal climate threats. His project, titled Mapping Community Exposure to Coastal Climate Hazards in the Arctic: A Case Study in Alaska's North Slope, integrates Geographic Information Systems, remote sensing, and other mapping tools to identify areas most at risk. What makes it particularly unique is that residents of the communities where he works are active participants in the research process. “I do community mapping. I develop an erosion risk database in the North Slope, and then I create maps from that data to engage communities to both verify the maps, expand on them, and make sure the maps I create are locally usable,” Brady explained. Ultimately, the map products that result from his work will be valuable resources to help communities and local officials plan for their needs in the face of a rapidly changing landscape. Brady’s research takes a deeper look at areas where high erosion rates overlap with things people value. “Near villages I'm working in, the erosion rates are severe, though not as severe as in other areas. Where I’m looking, we are seeing erosion rates of up to 10 feet per year in some places,” he said. Over the past 2 years, Brady has conducted dozens of open-ended and semi-structured interviews with residents in Wainwright, Kaktovik, Barrow and Nuiqsut to get a better idea of where erosion is affecting people’s lives most. During these conversations he and the participants highlight areas of high risk on paper maps. A number of themes emerged from those initial discussions. “Traditional land use areas were a primary concern. In addition to Native Allotments, there are a lot of archaeological sites and cultural heritage resources that are significant. These are places where there still tends to be heavy activity. For instance, during the summer months communities often still use many of these places,” he said. Residents also worry about the impact erosion may have on potentially contaminated Cold War sites that are near the marine habitats villagers often use to fish and collect other sources of food. With the information identifying the assets at risk from erosion that villages cared most about in hand, Brady moved the next phase of his work—inputting this into a database and then developing accessible, web-based applications called story maps to share it more broadly. 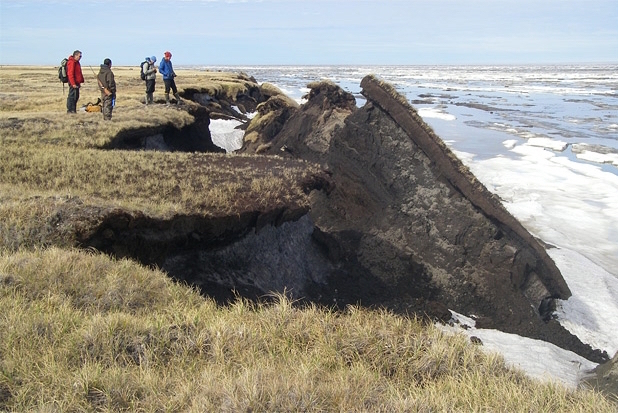 Brady returns to these North Slope communities this spring with large, 10-foot long printed erosion risk maps of the region to verify the information in the database and speak with more community members about areas experiencing high erosion. While Brady is in northern Alaska, he will also host usability workshops with local officials to explore how this spatially detailed erosion hazard risk information can be applied. “At the end of this process, what I hope we all walk away with—and that other scientists can learn from, too—is the value of community engagement in research. I hope this process creates long term relationships that continue to grow, as they are the key to long term engagement on this issue,” Brady said.